Home office layout, being organized and a few other (fuzzy) things inspire me to be ridiculously productive. Want a sneak peak? Here it is! I love my work space and I'm in it A LOT, so sharing it with the world is a true pleasure. Hopefully you'll get some inspiration for decorating a home office and motivational office organization ideas. Enjoy! There are floor-to-ceiling windows on the wall to my right, and the natural light is abundant and very refreshing. These windows are also fantastic for my Pug Brisket to stay alert as she's the one in this household that's on neighborhood watch. I love having her in my office while I'm working too. Whether she snoring like a jack hammer face down in the fuzzy white rug or she's barking as ferociously as she can at the big, black dog walking by, she makes me happy. She constantly reminds me to take a breath and live in the moment, and I truly cherish that. Next, the kitchen is through a doorway on the wall to my left. It makes it so easy to grab more coffee or put together my lunch and get right back to what I'm doing. Some people might be tempted by something like this, but I'm such a workaholic that the reminder to get up and eat a bite is good for me. Lastly, through a doorway on the wall behind me is my front door. On sunny days, I leave the screen door shut with the front door open. It brings in more light and also gives Brisket more viewpoints for guarding the house. I sit in a chair that rolls and swivels, so I can easily see all of these wonderful things around me and enjoy my home office layout in all its glory. LOL! Look at Brisket's face in the above photo. Such a cutie. Ok moving on...there are 2 sections of my office that I adore above all else. 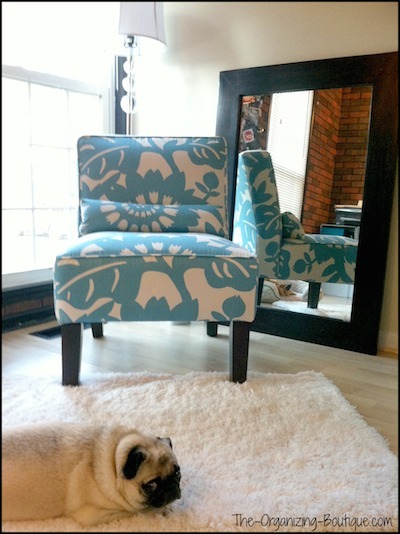 First, I heart the corner that has a window, a bright blue floral chair and a white comfy fuzzy rug. It's a beautiful area. I don't sit in the chair much but others do, and that's what makes me happy. I look at the chair and I think about my husband John sitting there while we brainstorm or my Pug Brisket sleeping on it (with one eye open to see what's happening outside, of course). Second, I absolutely adore the little notes that my husband leaves me on a regular basis. I'll usually find one resting on my keyboard when I get to my desk in the morning. 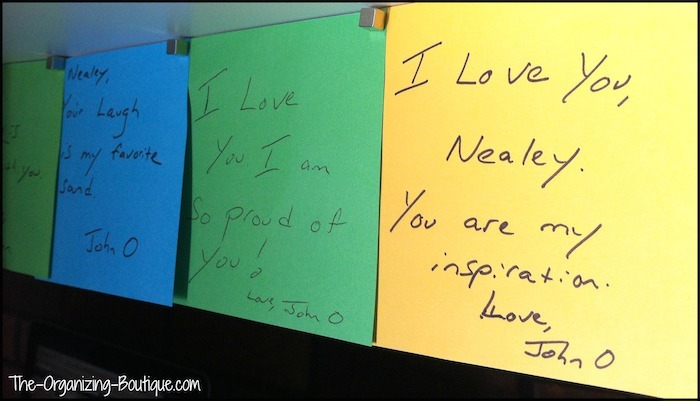 They are happy little inspiring messages that I cannot resist, so I started displaying them up on my desk and I love, love, love that they are always in sight, in mind. 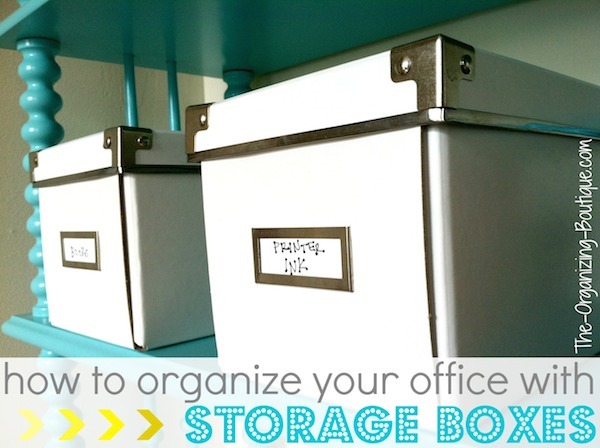 And of course, I couldn't finish this post without giving my office organization a shout out! I'm a professional organizer, and yes my work space is very neat. It's one of the things that contributes to my crazy productivity, and I love it. I adore these office drawers that I made over with Washi tape. They hold the small office supplies (like paper clips and a stapler) that I use frequently, so these beauties are reachable right on my desk. I also love my colorful office storage boxes (white ones shown so click the photo below to see the colorful ones). They are fun and pretty. It's easy to put stuff away and keep my work space clear, and THAT uncluttered environment makes it easy for me to get so much done. 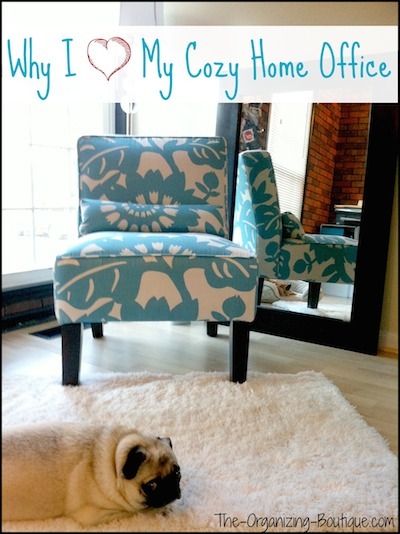 So...my home office layout, my favorite decorated corner, my love notes and my office organization (AND my Pug, of course!) all make up an environment that I love to work in and therefore have constant explosions of productivity. Want to see more? 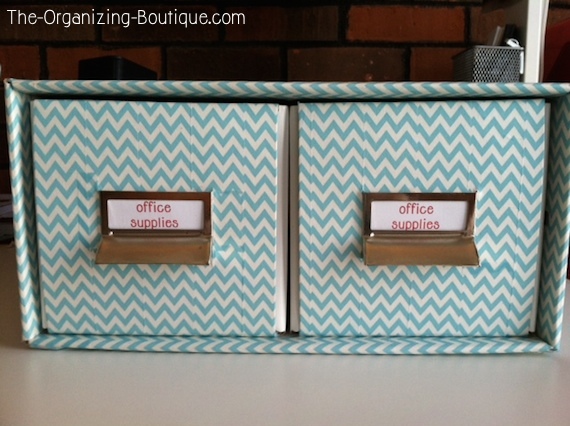 Here's how I decorated those office drawers with Washi tape and here's how I organized my office with storage boxes. Happy organizing!